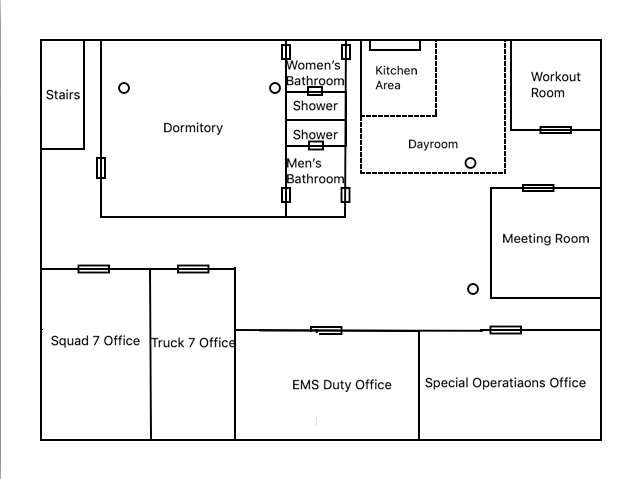 The following is a floorpan of the station. Driver/Operator- Responsible for driving safely to the call. On a Fire Call - Responsible for water supply. Once a water supply is flowing and supply line is secured, the driver will toss the ground ladders on the unit to the alpha side of the structure. The driver will also be prepared to assist the company in any way possible. On a Rescue Call - Responsible for charging the protection line and then helping set up extrication equipment and shuttling extra cribbing if needed. Officer- Giving scene size up (including 360) and controlling their crew in a manor that they deem safe and fit. On a Rescue Call - After size up, assist with setting up equipment and if necessary assist with extrication. On a Fire Call - assist with flaking out the hand line and back up the FF on the nozzle. On a Rescue Call - Responsible for the cutters and stabilization. Hoseman 2 (Driver Side Backstep)- Responsible for hitting the hydrant and making the connection on the drivers orders. On a Fire Call - Secure water source then grab a tool and make way inside on the line and assist with line management. On a Rescue Call - Responsible for spreaders and ram. On a Fire Call - Select the hose that they deem fit unless otherwise specified by the Unit officer. Stretch and extinguish. On a Rescue Call - Stretch the protection line and stand by. Driver/Operator-Responsible for driving the tractor safely to the call. On a Fire Call - Setting up the areal and going to the roof. Responsible for ventilation with tiller man. Responsible for ladders and hooks. On a Rescue Call - Set up extrication equipment and shuttling extra cribbing if needed. On a Fire call - The Officer will pair with Truckman 2 and Junior Truckman and will bring a hook with them inside. Tillerman- Responsible for driving the tiller safely to the call. On a Fire call - The Tillerman will pair with Driver to perform ventilation. Responsible for all saws. On a Rescue Call - Responsible for Rams. Senior Truckman - Responsible for forcible entry on the fire ground with Truckman 3. On a Fire Call - Pair with Truckman 3 for forcible entry. Take set of irons. On a Rescue Call - Responsible for vehicle stabilization. On a Fire Call - Will bring a hook and water can inside while operating and conducting searches with officer and Junior Truckman. On a Rescue Call - Responsible for the Spreaders. Truckman 3- Responsible for forcible entry on the fire ground with Truckman 3. On a Fire Call - Pair with Senior Truckman for forcible entry. Take other applicable forcible entry tools. On a Rescue Call - Responsible for Cutters. On a Fire call - Conducting Searches with Officer and Truckman 2. Take Irons. On a Rescue Call - Responsible for lights and cribbing. All SCFD firefighters will be issued a Cairns 1044 helmet. ESS Innerzone 2 Goggles and the internal Defender visor will be installed in all department issued helmets. Helmet tetrahedrons will be Scotchlite triple trim matching the yellow and silver trim found on SCFD turnout gear. Firefighters are free to use personally owned helmets at the discretion of the SCFD Department Chief. These helmets must be NFPA 1971 2018 edition compliant and the color of the helmet must match the rank of the firefighter. Firefighters may also customize personal or department issued helmets with stickers and helmet bands. Firefighters must also use a helmet shield that matches the SCFD color scheme and pattern. Firefighters are not authorized to void any NFPA certification on any turnout gear in any way. All Firefighters will be issued two coats and two pants fitted for them. 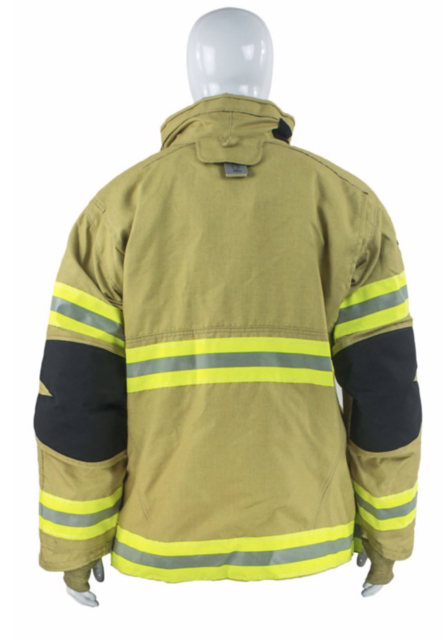 Turnout gear will be tan gear with yellow and silver Scotchlite triple trim for firefighters. 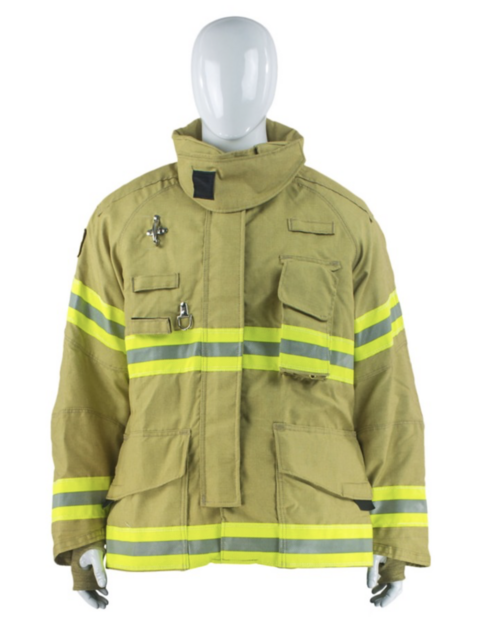 Turnout gear will be tan gear with orange Scotchlite triple trim for Lieutenants and Captains. Chiefs will be issued white turnout gear with yellow and silver Scotchlite triple trim. SCFD will be written across the shoulder blades in the same yellow color as the trim color. Firefighters will also be issued two name plates with their last name printed on them in the trim color. These are fastened to the gear through buttons sewn into the coat. Name plates and turnout coats or pants cannot be laundered in the station. They must be sent to the department ISP certified cleaning location. 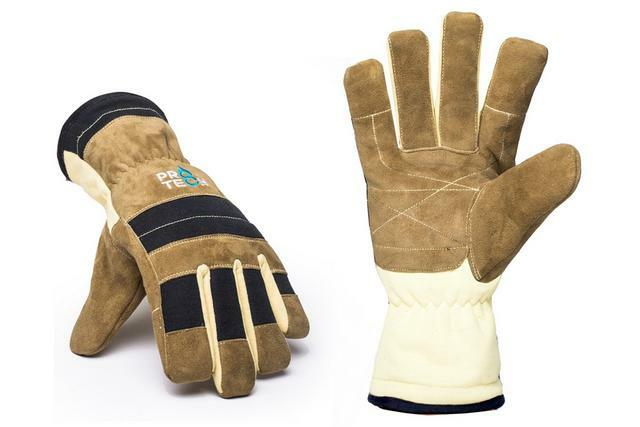 Firefighters will be issued two pairs of Pro-Tech 8 Titan Pro Gloves for structural firefighting. These can be laundered in the station or they can be sent to the department ISP certified cleaning location. Firefighters will be issued one pair of Dragon Fire Next Generation First Due Rescue Gloves for vehicle extrication and other non firefighting applications. 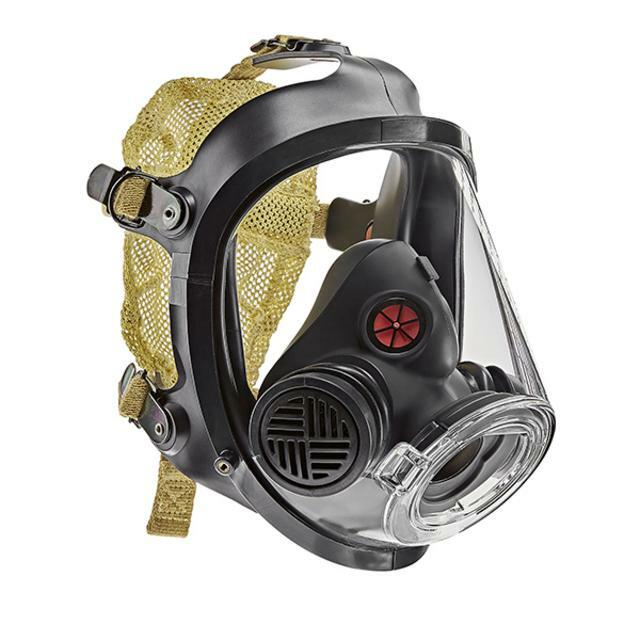 All firefighters will be issued two GORE Particulate Hood Ultra C 6.2s. These can be laundered in the station or they can be sent to the department ISP certified cleaning location. All firefighters will be issued one pair of HAIX Fire Hero XTREME, 11" Leather Boots. SCFD uses SCOTT Air-Pak X3 Pro SCBAs. The cylinders are SCOTT 5.5 4500 PSI bottles. These will provide approximately 45 minutes of breathing air. These air packs are equipped with Snap fittings for quick changes. The low pressure regulators will show the unit number. 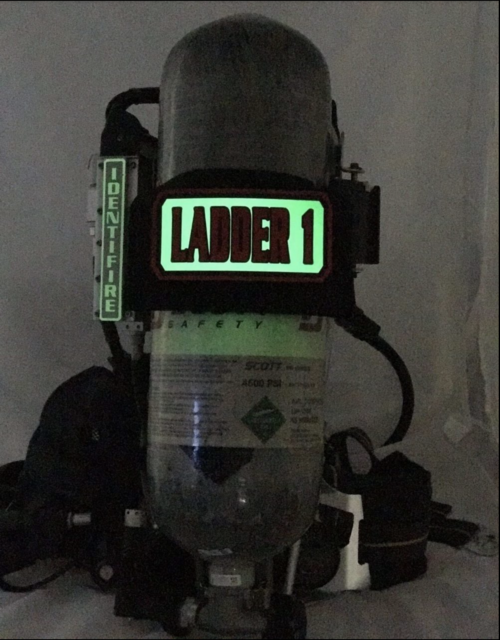 The tensioner band will have the letters SCFD written across it on and IdentiFire band and the high pressure regulator will also have the unit name written out. 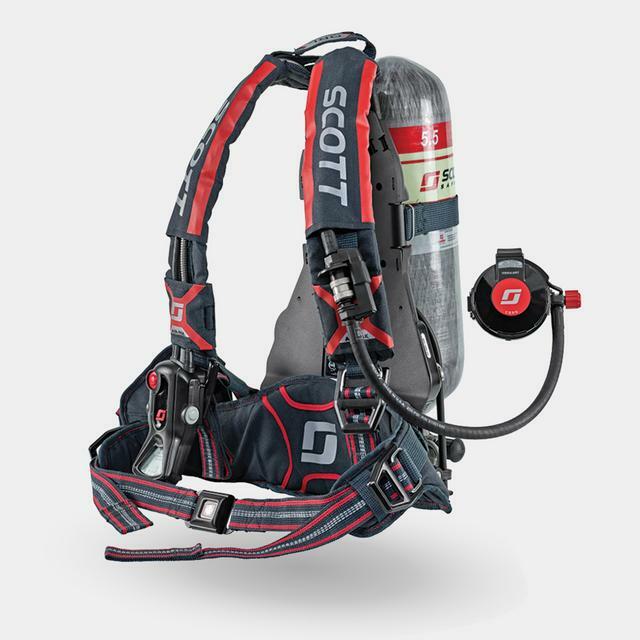 All firefighters will be issued their own personal SCOTT AV-3000 HT face piece for their SCBAs. These will be equipped with IdentiFire decals on the mask for accountability and identification purposes. The identifiers will show the firefighter's name across the bottom of the face piece. The annual Christmas party is coming up, and I'm inviting everyone and their families to the fire house again. This year, we will be starting the Christmas party during the week of December 17th, and it will continue through the New Year hopefully. If you guys have any questions, then shoot me a message on Discord or on here. You don't have to RSVP, but feel free if you want. I hope to see all of you there for some character development and some traction.